What is the AREN Core Infrastructure? 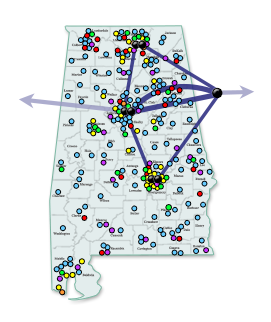 The Alabama Research and Education Network (AREN) has brought Internet connectivity to schools, universities, libraries, government entities, and other institutions in Alabama since the early 1990s. In the early days, AREN was able to serve all clients with a single T1 (1.5Mbps) connection to the Internet. This provided access for e-mail and the World Wide Web (WWW), which were just becoming popular. With each year came new developments in technology. As needs grew, so did AREN. Today, email and WWW are household terms. Technologies such as multimedia streaming are more prevalent and contribute to increased demand. In addition, we are seeing a new paradigm develop with the deployment of laptops and iPads as part of the one-to-one initiatives. As mentioned earlier, AREN started with a single T1 connection to the Internet. To ensure continued excellent performance for AREN clients, AREN's Internet access has grown from 1.5Mbps to 24Gbps of Commodity Internet. In addition, AREN has access to 10G of Research and Education specific Internet access (I2, National Lambda Rail, etc.) provided via our partnership with Southern Crossroads (SoX). The AREN backbone consists 11 network nodes (fielding AREN clients and/or providing Internet egress) interconnected with multiple 10G Ethernet circuits. If the Internet connection in Atlanta fails, the backbone provides a life-line to the alternate Internet egress connection in Dallas. The Governor's distance learning initiative is allowing K-12 students across the state to take courses from teachers in other parts of the state using AREN. The bandwidth of the backbone allows all of AREN's clients a great deal of capacity for in-state traffic. The backbone fully supports the Quality of Service (QoS) technology needed to provide good voice and video connections for K-12 and other clients on the network. The backbone would require multiple simultaneous failures to isolate any of the 11 network nodes. As you can see, the statewide backbone has many benefits. From 1.5Mbps to 24Gbps, AREN has come a long way since the original T1 connection to the Internet. AREN continues to provide quality Internet and networking services for all clients, whether sending an email or using live video to take high school physics. If you are an AREN client and would like more details about our core infrastructure, please contact our Network Support Manager, Ray Jacoby at 334-242-0132. You can also reach us by calling the helpdesk at 1-800-338-8320 or emailing us at helpdesk@asc.edu.